241. May 5, 2005. This American Shorthair is brand conscious and would rather starve to death. Know what the breeder wants. 240. May 2, 2005. "Ask me when I sleep?" 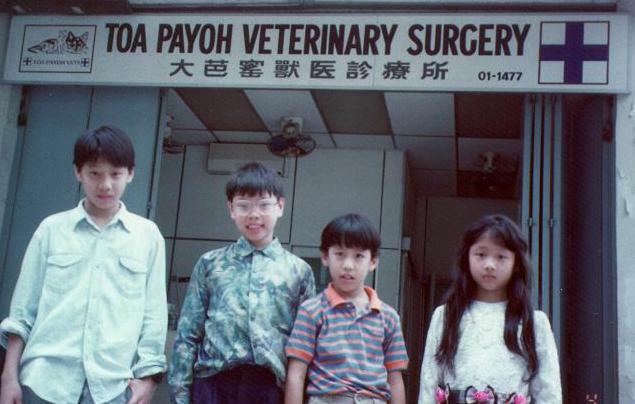 the breeder puffed his cigarette, rubbing his red eyes. 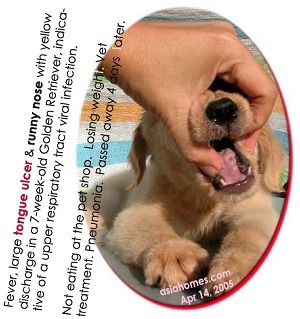 "Not ask 'do I ever sleep'," the breeder said to the vet. 239. May 2, 2005. Are looks everything, even in dogs? Yes. A free cosmetic surgery from a vet so that he finds a better home rather than be sold at fire-sale prices languishing in a pet shop. 225. 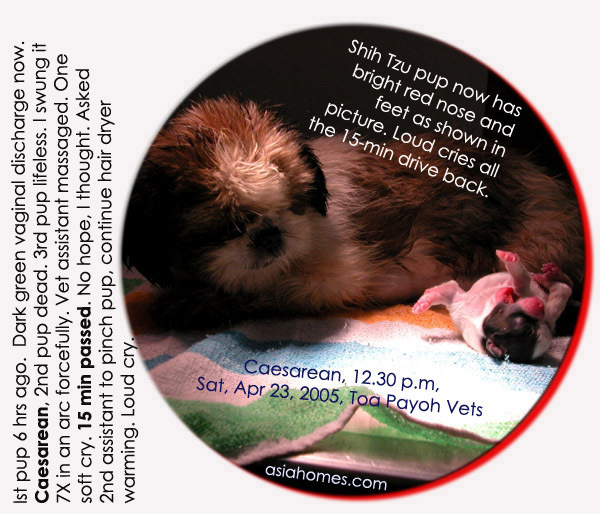 Apr 22, 2005. 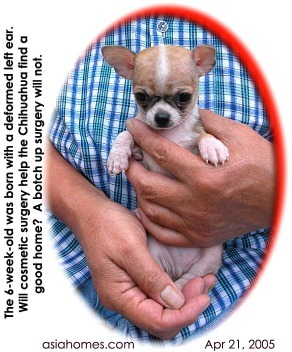 Handsome Chihuahua, 6 weeks old, was born with a left deformed ear may languish unsold in a pet shop. What's the solution? 237. Apr 30, 2005. Listen closely. Know what the breeder wants. 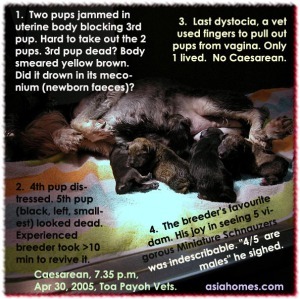 A Caesarean. Live puppies. 236. Apr 29, 2005. Listen closely. Know what the client wants. 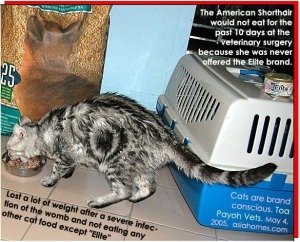 She wanted kittens, not a spayed cat. 235. 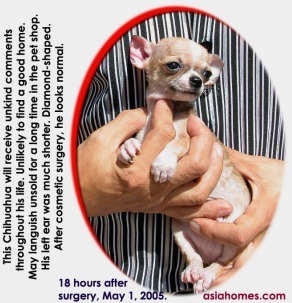 Apr 27, 2005. 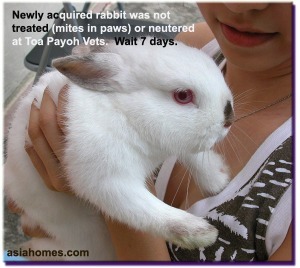 Rabbit needs to be observed and to adjust for 7 days in new home before any treatment. New rabbit may be stressed 234. Apr 26, 2005. 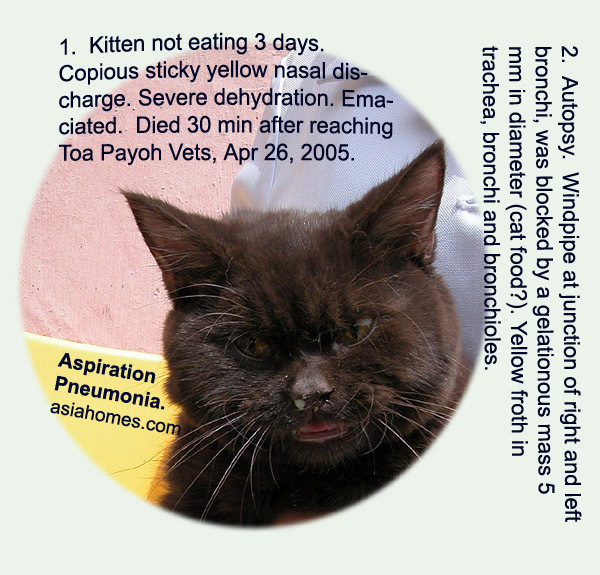 Force-feeding a kitten or giving medication may result in the food/drugs flooding the lungs. 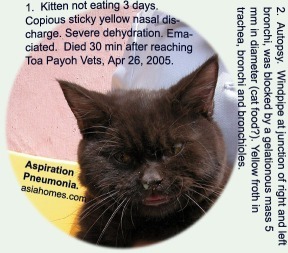 Aspiration pneumonia in a kitten. 233. Apr 25, 2005. Pup had very painful but very clean ears showing "signs of diabetes." 232. Apr 24, 2005. A large tongue ulcer in a Golden Retriever puppy with upper respiratory tract infection. 231. 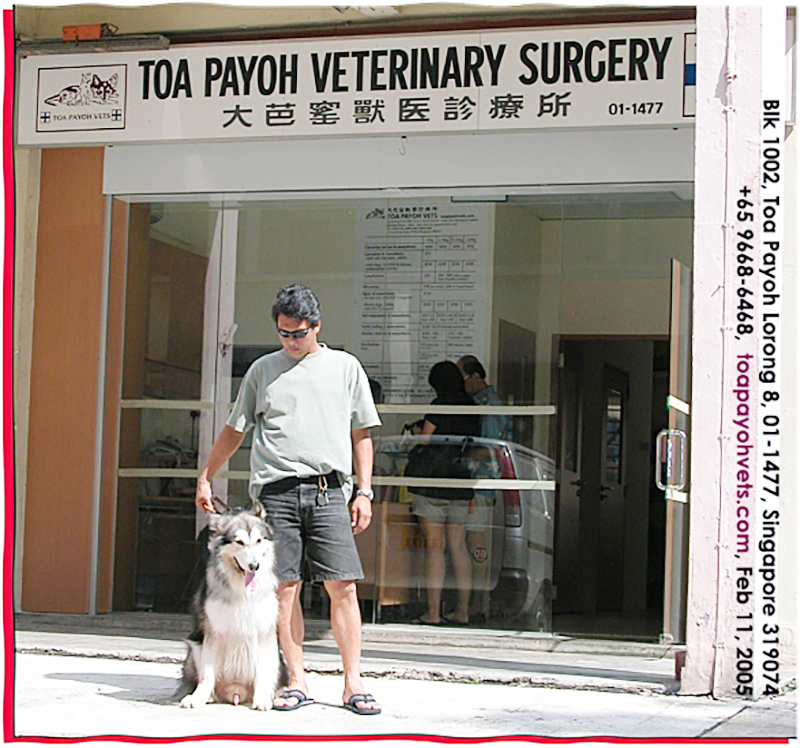 Apr 24, 2005. Green vaginal discharge usually not a good sign that any pup inside the womb would survive. 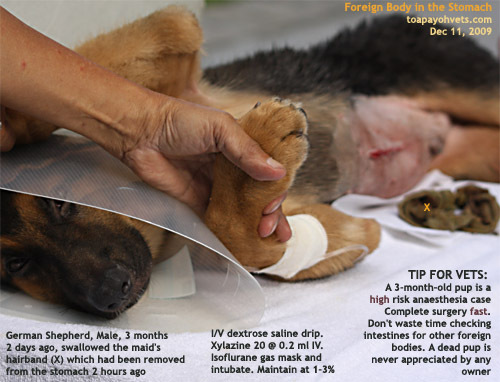 > 15 minutes of neonatal care, no hope for this puppy, the vet concluded. 230. Apr 24, 2005. 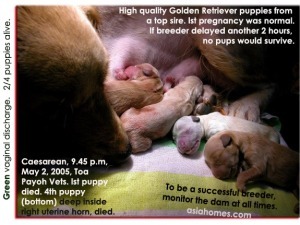 Breeders need to monitor carefully overnight. Toxic blood. 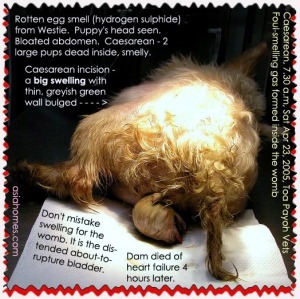 Toxic blood killed puppies and dam. 229. Apr 23, 2005. 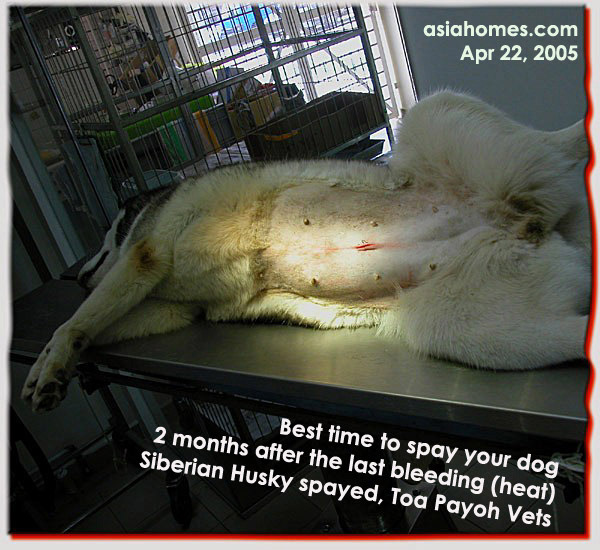 Spaying 2 months after the heat - very little bleeding. Good for the female dog. She was slimmed down. 228. Apr 23, 2005. 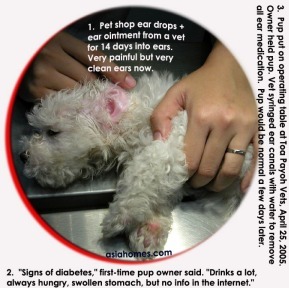 The interest of the female dog on heat may conflict with the interest of the owner to prevent unwanted pregnancy.